We recently tested the Xentec HID kit in our Toyota 4Runner. We went with the 8000k kit to see how the color would vary from our 6000K Kensun kit, and we wanted to see how the quality compared. 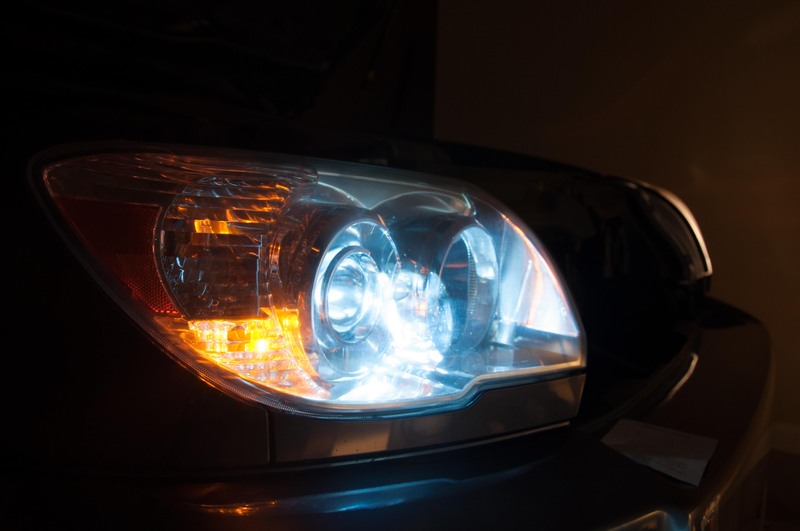 Ultimately, we wanted to give our readers a less expensive option when making their decision on HID headlights. When the kit came in the mail, we immediately noticed a difference in the size of the box vs our other HID kits we have reviewed. The contents of the box looked, well, cheap compared to the other kits. The image below shows the difference between a normal-sized ballast and the ballast int he Xentec kit. The Xentec ballast on the left is a quarter the size of the JLM ballast on the right. The JLM ballast is exactly the same size as the VVME and the Kensun ballasts on the HID kits we’ve also reviewed. It’s evident from the photo that the Xentec ballast on the right is going to be more durable and longer-lasting than the one on the left. While the kit comes with all of these items, the quality of each of these items leaves a lot to be desired. As previously mentioned, the ballasts are made out of plastic, the connection cables have to be assembled, the instructions are one paragraph long, and the kit does not come with a cable that connects directly to the positive terminal on your battery. The kit only took about 30 minutes to install. We’ve got to be honest…if we hadn’t previously installed HID kits, we wouldn’t have known how to install this kit. The instruction sheet that comes with the kit is a joke. Once installed, the Xentec kit actually doesn’t look too bad, although it wasn’t very bright. 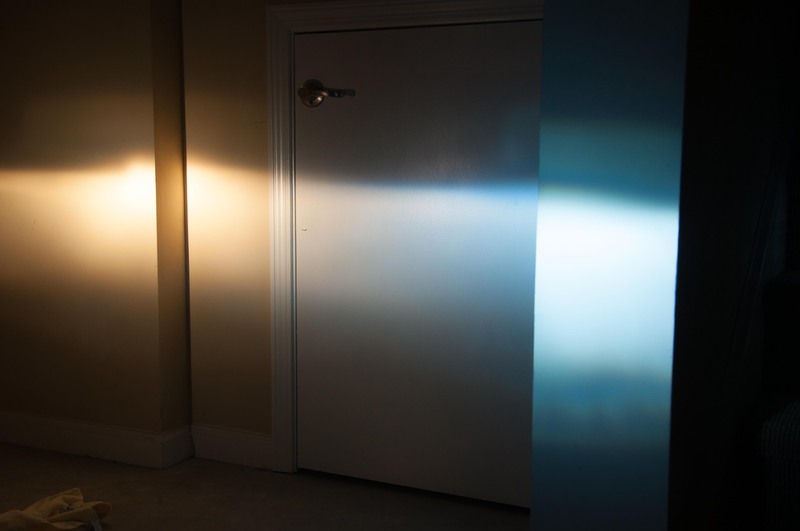 The 8000k Xentec Kit vs. a standard Halogen bulb has a blue color to it, and is a little brighter. However, compared to other kits we’ve reviewed, it’s extremely weak and very low quality. The kit only costs $35, which is cheap, but with this kit you get what you pay for…a cheap kit that won’t last very long. Rather than waste $35 now on a Xentec kit and risk getting caught in the dark on the road, we’d recommend purchasing the Kensun Bi-Xenon kit. It’s a little more expensive, but is more durable, brighter, and better quality than the Xentec Kit. Amazon has the Kensun kit for just under $70. They’re a better bang for your buck and will last you years. Check out our review of the Kensun Kit. Hey there JJ! Thanks for coming by. Actually, if you use the instructions on the http://headlightreviews.com/kensun-hid-kit-installation/ you should be able to get the Xentec kit installed. Depending on the vehicle type you have, it might require that you actually swap the order of the three prongs in the plugs. Let us know how the install went! Wow. That’s pretty low. I will say, the customer service at Kensun is far superior! Have you received your Kensun kit yet? If so, how do you like it? Just received my xentec kit and it is bad neither ballest is working. hopefully they support their equipment after sale. I certainly hope so. Let me know what kind of service you end up getting! Best of luck to you. And thanks for visiting! I can’t find any info on a warranty. Kensun kits, however, do come with a two year warranty, and their customer service has been great. Not only have I heard positive things from other customers, but I’ve also had a great experience with them. I purchased the xentec hid’s for my focus. Was pretty simple to figure out almost plug and play actually, high low and fog, have had for a few months definitely an improvement over stock. No issues as of yet will update if I run into any issues. Bulbs were h1, and h11’s. Just bought a used 2003 E320 Benz. It had the ZenTec kit installed already. I have never installed one of these before, but would it be possible to swap in a Kensun kit? I have had the car 2 months, and one bulb is out, the other is flickering. Thanks for your help. Dean, sorry to hear you’re having issues. If it were me, I’d probably just swap out the entire kit as long as you’re going through the trouble of swapping either the bulb or the ballast(s). Check out our tutorial on how to do the installation. Between having them installed already and our video, you should be able to get them installed no problem! I see people are having issues with the Xentec kits. For me on the other hand, I’ve never had an issue. I’ve Installed several kits over the years. The new SLIM ballast is great for tight spots and easy to install. Each kit comes with bulbs ballasts and extension harness for vehicle to ballast hookup. It’s an easy install. All plug n play. Someone was commenting that there wasn’t a power wire to the battery. That is optional relay wiring and warning cancellor for vehicles that require it. They are items sold separately. All in all, I am giving Xentec a 5 star review. I came across your website, I have had Xentec for a number of years on my bike. One bulb has burned out, now wondering if I can find bulbs or buy a whole kit. To my knowledge they sell individual bulbs on various websites, such as Wal-Mart, eBay, etc. I’m not sure which color you have in mind, but give it a quick google search and see what you find. If you still can’t find them please don’t hesitate to reach back out. And glad to hear they have lasted so long!